Our tiny tots - enjoying their freedom in a clean and green environment. The school cabinet of OAK Valley ready to shoulder their responsibility. OAK Valley students' patriotic salute to their nation. Students exhibiting their creativity using waste material. Welcome to the ambient environment and the enviable location spread across three and a half acres of lush green campus of the Oak Valley School. It is located away from the din of the city traffic and pollution in a calm peaceful, clean and healthy environment with the state of the art infrastructure with all the required facilities in a well planned and the most beautiful way possible for the overall development of your child. Teaching and Learning takes place here in a friendly atmosphere. Oak Valley has an outstanding faculty with a tremendous experience base and qualifications. They love working with children and helping them to grow and develop the attributes of the learning to which we subscribe. We implement one of the most co-operating teaching and learning strategies. This startegy is useful when teacher wants to point out the fact that not all in the class have the same point of view or that there are multiple solutions to some problems. Oak promotes and encourages a number of physical activities through sports and games that is an essential ingredient for the personality development of every scholar. We also offer Dance and Music Classes. A digital classroom is a boon to the present generation and is a fool proof method for better understanding and concept clarity at all levels right from nursery to grade 10. 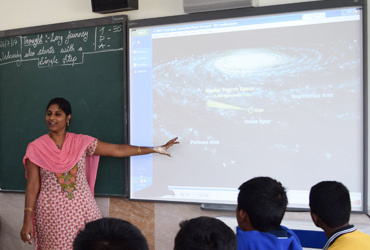 So we have equipped all our class rooms with touch screen digital boards along with projectors, desktop and speakers as it is an aid for both the teacher and the student which inculcates interest and enhances the class room learning activity to the maximum extent possible.. The green lawn caught our attention on our first visit & then all the other facilities like- library, labs, auditorium, indoor & outdoor games, skating, swimming, music, dance etc. I'm a parent who focuses on the holistic development of my children which is what I've been able to get from OVIS as the school has put in a lot of plan & effort in that direction. The academic progress of my kids is comforting & I'm happy with the hygienic conditions of restrooms. I'm able to see the dedication of the staff and the management in helping the children to bring out the best from them. Taking care of my children by school is really awesome. My both sons have improved much in many aspects including studies, extra curricular activities, respect towards elders, discipline etc. There is personal care here for each child. I am very glad that I have joined both my children in this wonderful study environment. We are happy with the school management, teachers and the school environment. I was to shift my house near to office but because of the school, I wished to travel for 1 1/2 hr. to office rather than to leave the school. All the teachers are very good and during the PTM(s) we are received very well by them. 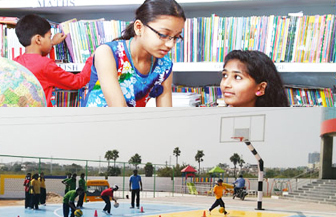 The school has an outstanding infrastructure along with quality education. My child showed a lot of improvement in both academics and sports. He has also improved his communication skills and I am happy that my child is studying in such a good school. The classes start from 11-06-2018 for Nursery and LKG. The timings are from 8:45AM to 3:45PM. The classes start from 04-06-2018 for UKG and the timings are from 8:45AM to 3:45PM. The classes start from 04-06-2018 for Classes I to X and the timings are from 8:30AM to 4:00PM. Sankranthi’ holidays are from 13.01.19 to 16.01.19 and the school reopens on 17.01.19 i.e., on Thursday. We have achieved 100% results in AISSE i.e., in 2018 CBSE Board 10th Exams. Oak Valley congratulates all it\'s Grade 10 students and teachers.